Andy, a Colorado native, grew up fishing for bass until he grew tired of that as a teenager and took up fly fishing on the Platte River outside of Denver. Ever since, its been one of his passions and pursuits. Andy joined The Colorado Angler after doing his guide training with Andrew, The Colorado Angler’s owner. When Andy is not guiding fly fishing trips, he’s a woodworker by trade. Rest assured that although he is a part time guide, he’ll be sure to get you into fish as he spends all of his free time chasing Colorado trout. 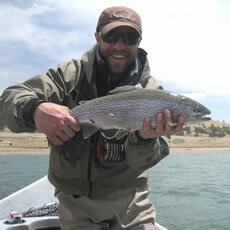 Andy’s favorite is The Colorado River due to its aggressive fish, big water-style fishing and wild trout. There’s nothing he’d rather be doing than targeting brown trout, rainbow trout and cutthroats on this magnificent freestone river. Andy lives in Littleton, CO, just south of Denver, with his wife of 12 years. He’s a passionate musician having worked in music production for much of his life. He now collects vintage instruments and synthesizers. Andy spends some of his free time shooting handguns as well.